The European Marine Energy Centre (EMEC) has signed Flemish wave energy developer Laminaria to test its innovative wave energy converter at EMEC’s grid-connected wave test site at Billia Croo, off the west coast of Orkney, Scotland. The official signing took place 15 December 2015 in Edinburgh coinciding with a visit by the Minister-President of Flanders, Geert Bourgeois. Laminaria’s technology – a surge operated attenuator – has a bespoke storm protection system build in to enhance the survivability of the device, allowing it to remain operational during storm events. Scale sea trials are already underway in Belgium to inform the design for the full-scale device that will undergo performance testing at EMEC in 2017. 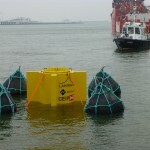 Laminaria will be the first Belgian company to test at EMEC’s test sites. “We have been pleased to welcome several visitors from the region of Flanders to EMEC recently, demonstrating an active interest in marine energy development for their impressive maritime community. 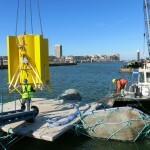 “In the last few years, Flemish company Laminaria has developed innovative technology for a wave energy converter, in collaboration with a string of partners in Flanders, such as the University of Ghent and the Port of Ostend, and with support of the Flemish Agency for Innovation by Science & Technology.